With the coaching staff spread out across the country once again this week, which 2015 and 2016 recruits received their offers to the University of Michigan? On Tuesday, 2016 CB/WR David Long (Los Angeles, CA) was informed that he had received an offer from the University of Michigan. David is an excellent cover cornerback. He has the necessary speed and agility to keep up with receivers 1on1. He has great back pedal speed and can turn his hips quick enough to not lose a step with his man. Since he’s already played as a receiver for his Loyola High School squad, he already has the ball skills that go along with a quality defensive back. David also has good size to play the Cornerback position, standing at 6’0 and weighing 175 lbs. "It's a huge offer for me," he said. "I've always enjoyed watching them play and the tradition they uphold. 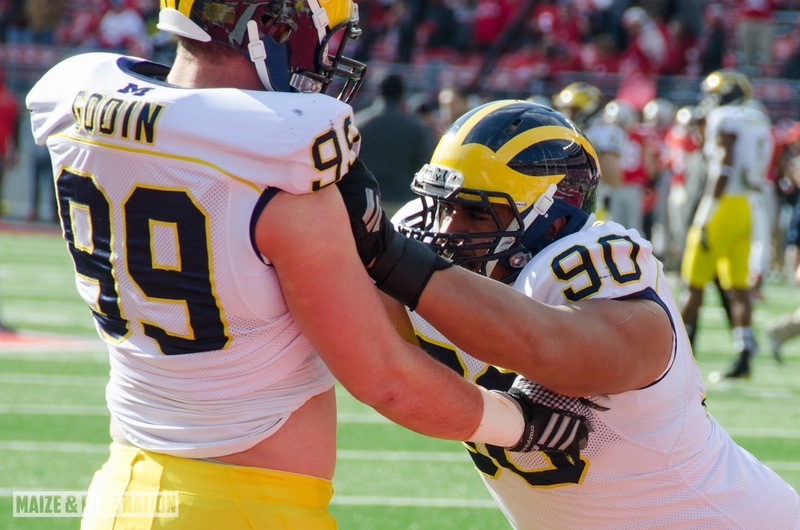 Regardless of last season, I still see Michigan as a powerhouse on the football field. I could fit them in the loop of my top schools instantly." David is currently ranked as the #36 Athlete in the country according to Rivals. The coaching staff continued to search for offensive weapons on Wednesday, with 2015 Wide Receiver Van Jefferson (Brentwood, TN) receiving a scholarship offer from the Michigan coaching staff. #Michigan has offered 2015 Brentwood (Tenn.) Ravenwood WR Van Jefferson. Recently committed to Ole Miss. Jefferson’s recruitment has been a whirlwind. Last August, he committed to Georgia and his recruitment seemed to slow down a bit. Then once his high school season was done, Van decided to take official visits to Ole Miss, Oklahoma and Georgia. After taking time to think about his options, Van decided to flip his commitment to the Rebels last week. Now with Michigan extending him a scholarship offer, Van will take an official visit to Ann Arbor this weekend. Van is an extremely talented Wide Receiver. He already has excellent size (6’2, 185 lbs.) to play at the college level. He’s not going to blow you away with his speed, but all the other attributes he possesses is what makes him such a dangerous receiver. He uses his route running and agility to break away from defensive backs and get open. Does a good job of getting separation from defenders with route running and breaks off his man with good speed. Very dangerous when he has the ball in his hands. Can follow blocks and gain additional yards as good as any high school receiver I’ve watched. Van has the ability to change direction on a dime and becomes very elusive when in open space. Jefferson is ranked as the #13 Wide Receiver and #138 overall in the 2015 recruiting class according to Rivals. In 2014, he had 67 receptions for 1,224 receiving yards with 13 touchdowns. Wednesday also saw 2015 WR Deontay Burnett (Gardena, CA) receive his scholarship offer from the Wolverines. In my opinion, Deontay has all the tools to strive in a Jim Harbaugh led offense. He gets off the line of scrimmage quickly, and hits his top speed in only a few short steps. Very good lateral speed, and could be dangerous in end around/fly sweep packages. Doesn’t have ideal height or weight (6-0, 165 lbs. ), but once he gets into a weight program in college, the weight issue will be addressed. Will need to work on his route running, but that can be fixed with coaching. Possesses excellent balls skills. Can easily go up and get the jump ball. Sticky hands and rarely drops the football. Very good body control, and can contort his body multiple ways to watch the ball. Not the flashiest receiver I’ve watched, but will get the job done on a regular basis. Deontay is a 3* recruit according to Rivals, and is ranked as the #59 Wide Receiver in the class of 2015. He will also be one of many visitors to Ann Arbor this weekend. Hudl highlights can viewed by clicking here. 2015 recruits were not the only ones to receive scholarship offers on Wednesday, as 2016 Linebacker Devin Bush (Pembroke Pines, FL) got a call from the coaching staff, informing him that he had an offer to the University of Michigan. Devin is a “do it all” linebacker. He has the ability to either line up either as a middle linebacker and stop the run, or lineup as an outside linebacker and blitz the quarterback. He’s a little shorter than a prototypical linebacker (6’0), but does have a good frame standing at 220 lbs. Has a very good burst off the snap and can blitz up the middle or to the outside. Possesses above average speed for a linebacker and gets to the ball carrier in a hurry. Sheds blocks with relative ease, and is a very good tackler. Devin does a good job of getting low, extending forward and wrapping up with ball carrier. In my opinion, Devin would be better suited off as a 3-4 linebacker, as is he excellent at stopping the run. Devin is currently ranked as the #3 Inside Linebacker and #127 overall according to Rivals. Only as a high school junior, Devin has an impressive offer sheet including; Georgia, Florida State, Florida, Miami, TCU, and UCLA. Devin's Hudl highlights can be viewed by clicking here. Only one offer was handed out on Thursday, with 2015 Defensive End Quayshon Alexander (Wayne,NJ) receiving his scholarship offer to the University of Michigan. Quayshon has a very impressive highlight film. He gets off the line of scrimmage with a good burst, and relies on his very strong upper body to push back the offensive line. Quayshon does a good job of shedding blocks with bull-rushes or using a “club” move. Quayshon regularly gets the offensive lineman on his heels, which leads to him getting into the backfield. Has a high motor, and has enough speed to catch the ball carrier. Only as a high school junior, Quayshon has good size (6-2,212 lbs. ), and will look to add on additional muscle mass in his senior season. Quayshon has all the talent to see a major boosting in his ratings by this time next year. Quayshon is currently ranked as a 3* recruit according to 24/7, and has a crystal ball reading favoring Rutgers at 100%. Quayshon’s Hudl highlights can be viewed by clicking here. A reoccurring theme on Wednesday was Michigan offering committed Running Backs. First up was Titus Booker (Grayslake, IL). Titus, who is currently ranked as a 3* tailback according to Rivals, seemed to be extremely excited about the Michigan offer and immediately made plans for an official visit this weekend. On Friday, these plans came crashing down to earth as he told Scout.com’s Beth Long that he would be cancelling his visit and sign with Wisconsin on National Signing Day. Michigan was one of the few schools offering Titus to play Running Back, as most feel he is better suited on the defensive side of the ball. On Wednesday afternoon, 2015 Running Back Corey Dauphine (Port Arthur, TX) received a scholarship offer from the coaching staff. Dauphine, who is currently committed to Texas Tech has since re-affirmed his commitment, and will more than likely not be recruited by the coaching staff any longer. In 2014, Corey had 1,215 rushing yards with 9 touchdowns and also won the 200 meter state championship for his Memorial High School squad. On Thursday, Michigan offered 2015 Running Back Orlando Bradford (Shreveport, LA). Brad Allis from 24/7Sports spoke with Orlando shortly after receiving his Michigan offer, and it’s not good news for Wolverine fans. Although Orlando said the offer was a “blessing”, he reaffirmed his commitment to the Wildcats, and will not be re-opening his recruitment. Who will fill the rest of Team 136? With National Signing day right around the corner (Feb.4th), Michigan has multiple spots open to fill their 2015 recruiting class. With Jim Harbaugh now at the helm, the coaching staff has made landing a Tight End, Defensive End, and Wide Receiver a priority. With around 14-16 scholarships available for this recruiting class, and 9 have already been filled, which 2015 recruits are most likely to join Michigan’s recruiting class between now and National Signing Day? Chris is no stranger to Michigan fans. Chris decommitted shortly after Brady Hoke was fired, and has since looked across the country for his new home. USC, Texas and North Carolina have all tried to sway Chris to joining them since his decommittment, but with no luck. Now down to his final two schools (Michigan, UCLA), Chris will go on ESPNU and announce his commitment on National Signing Day. Chris’s recruitment has been hard to read, as he’s taken lots of visits, and came away impressed with almost all of them, but on NSD, I expect Chris to choose the Maize and Blue and sign his name on a Michigan Letter of Intent. Weber is another name Michigan fans are familiar with. The Cass Tech star committed to Michigan last August and seemed to be a lock to stay during his recruitment. Fast forward to November, while Michigan was losing to Maryland and Weber took to twitter to announce he was decommitting. To throw a little salt in the wound, a few short weeks later Mike announced he was committing to Ohio State via twitter. Now, if I was asked two weeks ago if Mike would end up in Michigan’s 2015 class, I would have said “no chance.” So, what has changed? Other than meeting with Harbaugh in person for the first time earlier this week, not a whole lot. But, I do feel as if the meeting has had a major effect on Mike and perhaps it’s enough to flip the talented running back to Michigan. Ohio State has an absolute loaded young backfield and recently just had a commitment in 2016 RB Kareem Walker. Playing time won’t come as easy at Ohio State, and the chance to be a home-state hero at Michigan is just too much to give up for Mike, in my opinion. Van Jefferson is a name that has came out of nowhere. Currently committed to Ole Miss, Van will take an official visit to Michigan this weekend. Now, it’s not every day that Michigan flips an SEC kid, but with Van having roots in the Detroit area, it’s very possible that a flip does come to fruition. Van has all the talent to play from one, and I think that in a Jim Harbaugh offense, Van could be an all-conference type player. Tyrone Wheatley Jr. is another name Michigan fans are familiar with. Tyrone has had a very quiet recruitment and at one point it looked as if Michigan was a long shot to land the talented recruit. With USC as his presumed leader over the past year, I found it hard to believe Michigan had a chance. Now, with his father being hired as Running Back’s coach, I think that it’s just too much for Tyrone to pass up on to not become a Wolverine. Jarius, who is currently committed to Rutgers, will visit Ann Arbor on an official visit this weekend. Jarius has been on record as saying Michigan is his “dream school”, and with him being on campus this weekend, #commitwatch could be on in full force. Jarius is ranked as a 3* recruit according to Rivals. Quarterback Alex Malzone *committed on 5/12/14. Quarterback Zach Gentry *flipped his commitment to Michigan on 1/24/15 while on an official visit. Defensive End Rueben Jones *committed to Michigan on 1/24/14 while on an official visit. Offensive Lineman Nolan Ulizio *flipped his commitment from UConn to Michigan on 1/25/15. Late Tuesday night, Michigan lost a member of the 2016 recruiting class as quarterback Messiah deWeaver (Huber Heights, OH) took to twitter to announce he was decommiting from Michigan. While I’m not exactly shocked that Messiah decided to commit, I do find the timing rather strange. Earlier in the day, Coach Zordich was in Dayton visiting with both Messiah and current commit Tyree Kinnel. While I have no real explanation as to why Messiah decommitted, the fact that Michigan has been looking at multiple 2016 QB recruits (Eason, Costello), might have been enough to make Messiah look elsewhere. Perhaps when he committed, he was told that he would be the only quarterback taken by Michigan in 2016? Whatever the reason, Messiah will end up committing somewhere else by signing day next year, and we will more than likely have completely forgotten about this. So where could Messiah possibly end up? Well, Coach Dantonio from Michigan State paid him a visit on Wednesday, and Kentucky coaches Shannon Dawson and Derrick Ansley also visited later Tuesday. All in all, it looks as if either of these schools could end up as a likely destination. Messiah is currently ranked as the #7 pro-style quarterback and #219 overall according to Rivals. It looks as if 2015 CB Will Lockett (Manvel, TX) will not be flipping his commitment to from UCLA. Will took to twitter on Monday to announce that he will shut down his recruitment. 2015 ATH target Chris Williamson (Gainesville, GA) will announce his college choice this upcoming Monday, on Fox Sports South. 2016 OL target E.J Price (Lawrenceville, GA) released his Top 10 over twitter on Tuesday. The list, which was in order featured Michigan at #2. Price is ranked as the #6 OT in 2016, and #54 overall according to Rivals. 2016 WR Ahmir Mitchell (Egg Harbor City, NJ) also released his top schools on Tuesday, with Michigan being included. Ahmir was offered last year by Brady Hoke, and it seems as if his interest is still peaked with Jim Harbaugh being at the helm. Mitchell is ranked as the #8 WR in 2016 and #49 overall according to Rivals. 2016 RB target Elijah Holyfield (College Park, GA) picked up a scholarship offer from South Carolina. 2016 WR target Theo Howard (Westlake Village, CA) received a scholarship offer from Oregon on Thursday. 2016 TE Jake Hausmann (Cincinnati, OH) committed to Ohio State last Sunday. Hausmann is ranked as the #1 TE in 2016 according to Rivals. 2015 RB target Kentrail Moran (O’Fallon, IL) received a scholarship offer from Louisville on Monday. 2017 RB target Najee Harris (Antioch, CA) picked up a scholarship offer from USC on Tuesday. The talented back now has 10 scholarship offers. Najee will also be visiting Alabama this weekend.